Dear reader of our Watchguy blog. I enjoy acquiring and fixing watches that I find interesting. However it is an expensive hobby and the time I spend on my own watches takes time away from client watches. Therefore I have decided to showcase my collection to anybody who is interested. All watches I list on this page have either been inspected or serviced by myself personally. This is my own little project and Christian has very kindly allowed me to have a link to my site. He is not responsible for any of the watches I sell. Please click this link to enter the store. This entry was posted in German, Swiss, Wrist Watches by Mitka. Bookmark the permalink. Eterna & Longines…design sobre, montres en parfait état de marche, livraison le jour de la Saint Valentin et 2 cookies offerts dans le package ! Un rêve ! Pour l’instant my current bank account dit STOP ! Enchanté de la petite montre Helvetia achetée cette semaine. 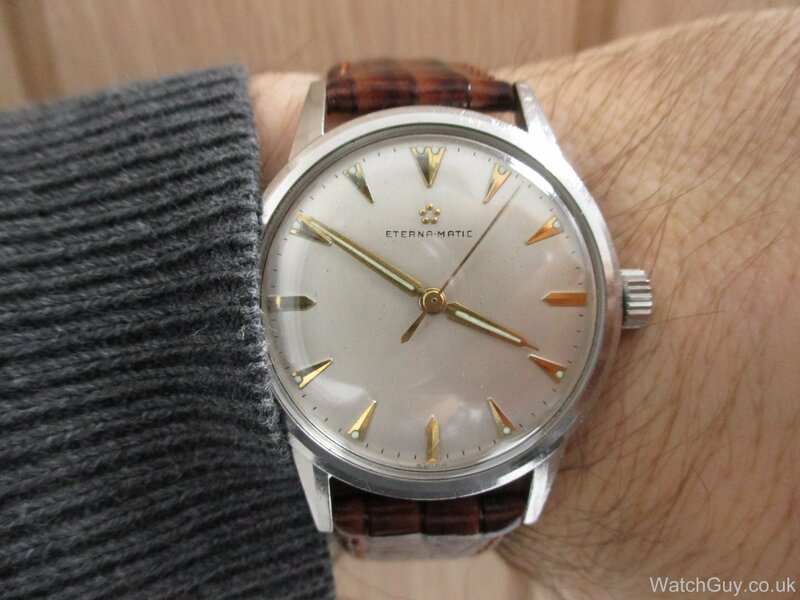 Ernest,I have just bought a lovely watch from this site(£220).Serviced and guaranteed by a reputable watchmaker.How do you justify your comment re.prices being three times true value?Please share your wisdom and tell me where I can source such watches for £75.If you know where they are,how much would delivery cost from Cloud Cuckoo Land? Brilliant. Nice to see an online shop where you can truly trust the Vendor! Some lovely, lovely pieces. The Longines in particular are stunning. Pricing is based on what I think the watch is worth based on quality and condition. it’s only my own opinion but this is a blog 🙂 and I would like to make some comments. Everything is not too bad except the prices(I personally don’t like vintage at all,small sizes, plexi crystals etc., but some people do like). I think everything is overpriced a lot in average about 3 times or more. I’m glad you have your opinions, but I believe the prices are reasonable. I belive you are very wrong in your assumptions. If you could offer me watches of this quality at 1/3 of the price I would appreciate some links? I am also rather baffled by the fact that you are so certain of prices on vintage watches since you don’t even like them? Are you really spending all the time needed for keeping an eye on market prices on stuff you do not like? Setting prices on vintage watches is always hard as the market shifts very quickly these days. Mitka is selling watches that has been fully serviced, and comes with a guarantee. That itself holds a lot of value. Anyway I am sure Mitka will entertain reasonable offers. So many beautiful pieces. I would buy a few if my wallet agreed with me. I wish you good luck Mitka! Oh no please don’t temp me. I’d love to buy one of those Helvetias but I must stop myself. No more watches in while. Very nice collection! I have seen a lot of them in the repair jobs. Will you keep any vintage watch for yourself? Yes I have some sentimental pieces that I would not sell:) But the majority of watches are for sale as I have other projects that would need financing. How did you decide on pricing? Chrono24 or another site? Pricing is based on what I think the watch is worth based on quality and condition. Not all the watches are cosmetically polished for a showroom, but the movements have all been serviced and repaired to a reliable state where I expect them to run well for many years to come. Assume you will be adding further watch’s in the future as and when . Best of luck with your endeavour, I’ll be endorsing your shop.